As a child Emery Kálmán wanted to be a tailor then he studied to be a lawyer. He tried himself in the field of classical music but became famous as the master of operetta. 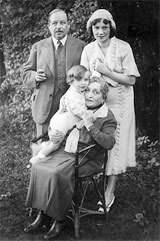 On October 24th 1882 when in the inshore holiday resort, in Siófok the little Emery Kálmán was born. 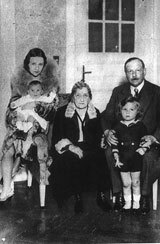 There had already two children, Béla and Vilma lived in the family. Later on three more children came into the world. In the first years of Emery’s childhood his parents didn’t struggle with finantial problems. 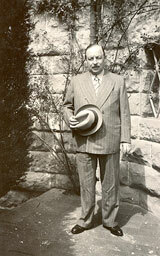 Charles Koppstein, his father used to be a corn-salesman and enterpriser, a kind and well-to-do person. Paula Singer, his mother-a gentle woman with an artistic spirit. She lived to see her son become world-famous. Although they didn’t lead a life of luxury they employed a man-servant and a cook. Emery Koppstein changed his surname to Kálmán while at the grammar school. (As a child he was surrounded by the folklore of the Balaton region.) Already, as a five-year-old child he proved to be a musical prodigy. When his mother and her sister, Vilma played the piano he participated actively. He used to crouch in the corner of the sofa and listened with enthusiasm and gleaming eyes. He inherited lots of talent from the family. In his mother’s family line there were outstanding musicians, while in his father’s line there were rabbis and teachers. In the summer of 1898 Francis Liedl, the famous violinist (1858-1900) came to Siófok. He rented a room in the Kálmán-house to be able to practise without being disturbed. It was from him that Emery Kálmán got his first music lessons. And already in Siófok he got acquainted with the theatre. He kept hanging around the Summer Theatre founded by Lipót Korpelesz, which stood next to the Kálmán-house. He attended all the rehearsals punctually without being asked. He had the courage to go backstage. He was impressed and charmed by the world of the theatre at a very young age. On the other hand the young admirer of rhapsodies didn’t even dare to dream of musical career, he wanted to be a tailor. By the time he was six he changed his plans He wanted to please his compatriots with legal protection and not with new clothes. The little Kálmán decided to be a lawyer. He attended the elementary Jewish public school where Adolf Rónai, the only highly regarded teacher taught. This school was so famous that Christian parents also tried to send their children here. This was not only due to Adolf Rónai, the world famous teacher but also because of that German language was taught here. Kálmán’s classmate was Géza Révész who later became a psychologist of the world renown. 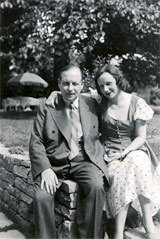 Emery Kálmán got his first piano lessons by Mrs Remcsák, a music teacher in Siófok while he went to the elementary school. Later he attended the Lutheran Grammar School in Budapest. Although Emery continued his studies at two schools, a grammar school and a school of music. When he had a little free time he sat at the piano and studied the works of Schumann and Chopin. He was charmed and intoxicated by music. On summer holidays he was nearly removed from the piano and sat down by the dinning table. By the end of the holidays he strained his hands so much as to strain a key in the lightest way gave incredible pain to him. Emery had turned 15 when in 1898 he first showed himself to public with the Fantasy of Mozart. Journalists and criticals watched the talent of the young musician like a hawk in the concerthall. Emery seemed to be so little and fragile that the newspapers enthusiastically acknowledged the talent of the “twelve-year-old musician”. In the last years of his studies, according to his parents wishes, he took the final examination taking his exams excellently. With this at that time he started his dual life because according to his parents wishes he applied for the Budapest University of Law where he studied eight terms and passed all the exams required. If we consider we can say he did very well because he was going for studying at the Academy of Music in the meantime. The musical activity took so much time and energy as he couldn’t even think of writing his thesis. His family subsidized his duties as an articled clerk but Emery had to raise money for his musical studies. An inflammation of a tendon in his hands made him give up playing professionally so he became a music-columnist of a newspaper. 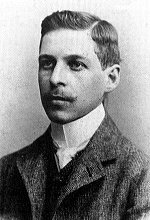 Then in 1902 he wrote his first musical work for the poems of Victor Jacobi. One musical work followed the other. Saturnalia was the most significant for him because he attached hopes to it. In the Kings Opera House in Budapest on February 24th 1904 the finalists of the composer course of the Musical Academy took their concert where the symphony of Emery Kálmán was delivered for the first and for the last time. However, he thought that this day was the first day of his career. Since then Kálmán believed that leap years gave fortune to him and February 29th was a benefit concert for him. Kálmán’s career as a lawyer wasn’t successful. He lived a dual life again with a little difference. He kept to the editorial office and not to the lawyer’s office as it was thought at home. We have to mention that he was welcomed with open arms there. A job of music critic with the money of 70 crowns was waiting for him. Next year he won the Robert Folkman Prize offered by the Musical Academy of Budapest. Owing to it he could spend 6 weeks in Berlin. Taking the opportunity Emery offered his works- Saturnalia then came the Endre and Johanna, which was a symphonical poem-to different German publishers. On the other hand he couldn’t find any publishers neither in Leipzig nor in Berlin even in Munich where he dropped in coming home. “It seems that my symphonies are useless for this world. If things go on like this I will do something terrible. I will compose operettas.” He was the laudest in laughing. Stooping to the operetta! The owner of the Robert Folkman Prize, Professor Koesler’s eminent student who deeply looked down these simple genres. However, possibilities worked out in such a way that Kálmán changed his mind and started to write operettas. It had to have happened. The idea was in the air. Johann Strauss and Millöcker who had been the nannies of this genre had slept in their graves for approximately ten years and the operetta was reborn suddenly. 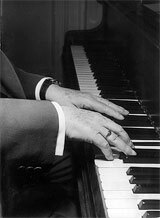 He rented a cheap little attic in Kroisbach near Graz to be able to practise without being disturbed. There he wrote his first operetta, the Tartar Invasion. It was performed in the Comedy Theatre in Budapest on February 22nd 1908. The audience clapped tirelessly, the dramatic personae were called back onto the stage again and again. When approximately a year had passed on January 21st 1909 the premiere in Vienna was also successful. 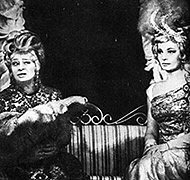 Some weeks later in this season there were premieres in the Theatre of Hamburg, in the Theatre of Berlin and in the Theatre of Prague. When a year and a day had passed his operetta could be seen in the fashionable Johann Strauss Theatre. His libretto was written by two famous Austrian writers while the story was set on the Hungarian grass-covered plain, which was familiar from Emery’s childhood. There were scenes of gypsy’s life and songs in it. Emery was a pessimistic character. 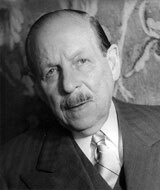 Yet this time Fritz Grünbaum, one of the librettists was unable to repress his bad premonition. “I like it all in all, I definitely like it.” He tried to reassure himself and Julius Vilhelm, his composer associate. “It could be waltz…” Grünbaum waved his hand in resignation. The first night of Kálmán’s latest operetta was on October 11th 1912 and without any fear the waltz mentioned before kept in the play. Next day its melody was sung on every corner. Its success was like an explosion. Grünbaum shrugged his shoulders uncomprehendingly and justifying himself he said: ” Well, the bomb it is. We never know whether it explodes or not.” By the beginning of the First World War Emery had written another operetta with the title “The Little King” but it wasn’t given a warm welcome. It was only applauded politely. Kálmán co-operated with different librettists. He established good contacts with two couples of librettists: Leó Stein and Béla Jenbach, as well as Brammer Julius and Grünwald Alfred. Their community of composer made most of the success for Emery. 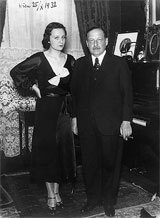 At the beginning of the war Emery was working on two compositions: the light and cheerful Miss Susie and on another operetta, which title, Csárdás Queen was given later. 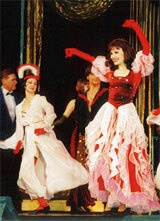 The librettists called it “Three cheers for love!”. 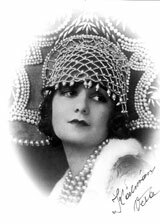 Miss Susie, later The Circus Princess was performed in Budapest on February 23rd 1915 and it was given a frosty reception. 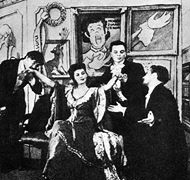 The operetta was renamed to Miss Spring and before long it conquered the American people’s heart. 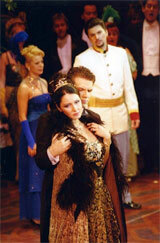 The Csárdás Queen, which was devoted to love was written by two librettists, Leó Stein and Béla Jeinbach. Stein was a well-known leader librettist and Emery considered it an honour to work with such a reputed and expert master. What’s more when he came to know the date of the first night his peace of soul vanished. “ Oh, my God. If only it wasn’t on 13th!” Well, the Johann Strauss Theatre leaving all of Emery’s protest out of consideration and sat the date of the first night on 13th. All tickets were sold for the first night. However, the performance was postponed in the last minute because Joseph König, the comedian had lost his voice. The new date didn’t reassure Emery though November 17th seemed a convenient date. He was convinced that the operetta would be a failure since postponing the date of the first night has a meaning of bad luck. On the other hand the consequences refuted all misgivings that Emery had. 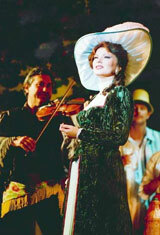 The melody of the new operetta spread in Vienna. Though the first night of the Csárdás Queen took place in the middle of the war. Neither the trenches of the front nor the discord of the gunfire could hinder the operetta in getting to Russia or to America. It is obvious that neither the librettists nor the composer didn’t become rich with it because Russia had fought with Austria and sooner the United States of America entered into the war. Imre’s oversee enthusiasts tried to get him outside the war zone. The government of Washington manifested its willingness in Emery Kálmán’s getting-away. However, Emery was shaken by the death of his brother and the deepening of his father’s diabetes. All these culminated in the fact that Paula Dvorzsák, his girlfriend, who was 10 years older than him, was chained to wheelchair for all her life. As it is well-known you had better burry yourself in work at such times. Emery wrote the songs one after the other. Forgetting the whole world he composed light, warm comedies. One of these operettas is The Circus-Princess. It dramatised Miss Susie. 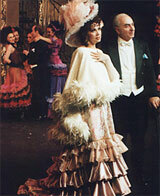 The first night took place in the Johann Strauss Theatre on September 21st 1917. There wasn’t enough coal, it was bitter cold on the auditorium, still it was a full-house performance. Then Vera Makinskaya, the young Russian actress entered into Emery’s life. The actress, who was born in Perm and emigrated with her mother in 1917, made a conquest of Emery. The feeling, which left 30 years difference of age out of consideration sooner ended in marriage. At this time he started to work on Violet from Montmarte and decided that he recommend it to his young wife. In a little while Vera gave birth to a boy (Charley) then she presented him with two little girls, Little and Yvonne. The Violet from Montmartre was about this little flower and only sensitive people and the real enthusiasts of Kálmán could have enjoyed this French euphonious music. It glided past the others unobservedly. In the 30s the formerly so famous Johann Strauss Theatre, where the operetta had been put on stage, was coming to an end. However, the Violet from Montmartre , which was performed in the Theatre an der Wien, conquered the stages of the European theatres. When some years had passed Rudolf Saucher and Ernest Wellich, two literary men of Berlin called Emery’s attention to a libretto, which had picked out moments of the Hungarian cavalrymen’s life. The Theatre an der Wien had a close relationship with Kálmán. On March 10th 1932 it performed the Daredevil Ridernew operetta. 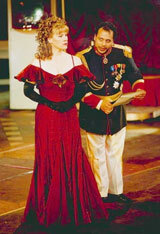 The leading part was sung by Hupert Mariska, the leader of the theatre. This was a real success. In the same year the Kálmán family moved to Vienna where the elite lived. The composer had a great success. Vera, his wife gave parties and all famous and influential people appeared there. On the other hand opposite his wife, Emery was a very humble person. Sparkle, giving and going to balls were always foreign to his nature. Besides the following children and other events in his family life he was working on his new operetta. He called it Empress Josephine and gave the right of the first night to the Zurich Town Theatre. The performance was on January 18th 1936. The last of Kálmán’s Hungarian first night took place in the City Theatre in1937. Empress Josephine, the title role was acted by Maria Németh, the greatest one of the European opera stars. In the meantime the aspect of Europe and in the compliance with it, the audience’s atmosphere was changing day by day. So for example, the interest towards the operetta in Vienna was decreasing. There was an explosive at atmosphere when in 1938 at the Hungarian-Austrian border German soldiers thronged threw. 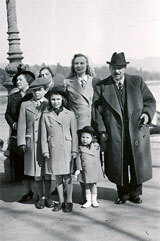 After the Anschloss persecutions of the Jews started in Austria. Kálmán couldn’t stay in the country any longer. First he travelled to Zurich then to Paris and at the end to the United States of America. There he found himself in Hollywood, home of filmproduction. Changes in his habitual life style and different moral norms and culture all left their marks on the composer’s life. In his last 20s he wrote only two operettas. 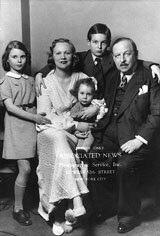 The Countess of Marica in 1945 and before his death the Lady Arizona, of which first night he didn’t live to see. They made only minor success and didn’t stay on the repertories of the theatres for a long time. Crowning his musical activity in Paris on April 11th 1953 Joseph Paul-Bencour presented the officer’s cross of the Region of Honour. Suddenly in 1949 Kálmán was affected by paralysis. Half of his face was paralysed and he wasn’t even able to speak. Although he was getting better for a short time, in Paris on October 30th 1953 his illness fought off him for good. On the 40th anniversary of his death he was given the posthumous freedom of his hometown. In honour of him a statue was put up to him in the Music Pavilon and a museum was furnished in as a memorial at his former permanent address. photos from a Kálmán Imre museum collection.